No matter what business you’re in, connectivity forms the backbone of how you get things done, communicate with your customers and market your business. One obvious way to help make your business better is to focus on the speed of your connection. Faster connectivity helps you and your team get more things done more quickly and makes things like transferring or backing up big files simple. At the same time, there’s more to your business internet connection than download and upload times. You’ll also need to focus on whether or not you’re getting the most from your connectivity. In this article, we’ll take a look at how you can create better experiences for your customers, drive business and employee productivity, and differentiate your business from the competition. Let’s look beyond the need for speed to discover how to get the most out of your business internet connection. WiFi is a key part of the customer experience in 2018. Just like electric lighting, air conditioning, or anything else considered a “perk” 50 years ago, your customers view your WiFi as a utility—a necessity that they cannot do without. Free WiFi is no longer a perk. It’s an important part of the customer experience that reflects upon you and your brand. Once you shift your thinking and understand that your WiFi is another way to communicate your brand experience to your customers, start strategizing how you can go the extra mile. You want to offer a network that is reliable, fast, and secure. Speed matters, and customers will notice if your connection is slow. Connection speed isn’t the end-all-be-all, however, because everyone on the network shares that connection. If you have bandwidth hogs, think about ways to restrict streaming from specific sites or forbid peer-to-peer downloading with a content filtering tool. There’s a delicate balance to achieve here, as these bandwidth hogs are still your customers. While it’s reasonable for you as the business to block certain bandwidth-intensive sites, you need to be careful about how you’re communicating that to your customers. Be sure to emphasize that this ensures everyone can enjoy a fast connection, rather than something vague like “site forbidden” or any other default language your content filtering tool uses. One of the easiest ways to make connecting to your WiFi a branded interaction, while also improving both perceived and actual security, is setting up a shared access point. 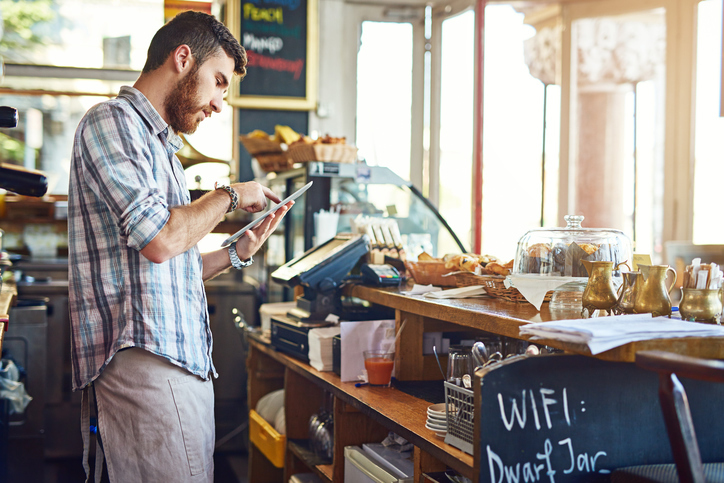 Service Set Identifier (SSID) technology makes it easy to allow guests to use your WiFi while remaining walled off from your business operations. Access point isolation lets you insulate your network from anything your customers might do to jeopardize your network security. Essentially, it creates a virtual network for everyone connected to your wireless network that prevents them from getting at vital components like your router or the data of other users. Another option is to set up a guest network. This configuration is broader, opening your customers up to a little bit more risk but making it easier, overall, for you to manage it. You can set bandwidth limits for the network, create a list of blocked sites, and keep things under tighter control. Either way, brand your login page and demonstrate to your customers the work you’ve put into providing them with a secure and sanitized connection. It’s also important not to underrate the confidence that a slightly more complicated login process gives someone logging in. Whether they know the ins and outs of network security or not, seeing that you’re competent will reassure them their connection is safe. Voice over Internet Protocol (or VoIP) technology uses your existing data lines to send audio over the internet. Since you’ve already got data set up with your business internet connection, there’s nothing to install to get it working. What’s great about VoIP is that it can scale with very little effort or cost: Just request and pay for additional virtual connections or increased broadband from your provider. You get the same features as a traditional landline phone—call waiting, call hunting, voicemail, conference calling, and more. You also get video conferencing and the ability to call an employee’s home computer or mobile device directly when working remotely. The best feature is that if your provider hosts your VoIP (as opposed to running it over your business’s own IP), the high level of redundancy provided by the cloud means that service outages are extremely rare. Simply configure your VoIP service to reroute calls to mobile or another alternate number, and you’ll be good to go no matter what happens. Another underrated way to use your business internet connection is to help with physical security. It’s fairly simple to set up security cameras and other monitoring technologies to keep tabs on the physical security of your business 24/7. Remember that physical security is just as important as digital security, and the two should go hand-in-hand. Beyond faster and faster speeds, it’s important that your network has what it takes to help your business get things done faster and give your customers the connection they need. Make sure that you’ve taken steps to provide a fast, secure connection, and that you’re taking advantage of VoIP and physical security technologies that synergize with a great business internet connection. Brand your WiFi so it’s a more prominent part of the customer experience. Configure a shared access point to secure your network. Look at VoIP technology to create a better solution for your business. Consider your physical security and how your network can support it.